“I just finished Ted Harty’s Intermediate Freediver Course, and it was one of the most content-rich, empowering, and exhilarating experiences I’ve ever had. You can see a video of his diving from the competition below. Here is his review of the course. Up until a few years ago I felt great anxiety whenever I swam in the open ocean. I am still not sure about what fueled this irrational fear, but it often kept me away from boat trips. Then I moved to Miami for work back in 2010 and my open-water phobia became a recurrent nuisance. By summer of 2012 I had mustered enough guts to tackle the issue head on. As irrational as this sounds I figured that to shake off my fear I needed to fully immerse myself in the solution – pun intended – by taking a freediving course. I figured if I could learn to dive to 66 feet on one breath, my anxiety around the ocean would most likely become irrelevant in the process. And I was right. I was careful in choosing a course because I knew I was going to need extra help to feel safe in the water. Luckily the web reviews showed pretty definitively that Ted Harty was the most experienced and the safest instructor in my area so I quickly registered for his three-day basic level course. From the first day of class I was pleased by Ted’s impressive command of freediving physiology. This was particularly reassuring because as a physician I wanted to get acquainted with that aspect of freediving. Then in the water the experience could not be safer. I really liked that Ted literally dropped all the way down right next to each student, every time. He duck dived and then crossed his arms over his chest as he finned down slowly, maintaining his face right in front of the student’s. He did this to look for signs of discomfort so that he could assist the student quickly should the need arise. He also occasionally made small gesticulations or hand movements to signal the student to relax, to dive slower or faster, or to keep proper body position during the dive. Then at the surface he enforced rigorous recovery breathing and pointed out what to improve upon during the next dive. It was impressive to see that even though he did this with every student, every time, he never got short-winded or less careful. These aspects of Ted’s teaching provided me with the kind of psychological reassurance I needed to get through the course. After I completed Ted’s course I realized how liberating it was to be in the water. Freediving is now for me what yoga and meditation is for others. These days I like to travel to remote coastal destinations to get away from it all, experience new cultures and freedive in beautiful waters. Doing this has given me the opportunity to share the ocean with a variety of freediving instructors and safeties. Just the other day I traveled to the Cayman Islands to do some training at PFI’s Dejablue 8 and ended up freediving with Ted one day. I was just doing some pull-downs to 100 feet, which I like to do with my eyes closed to get maximal relaxation out of the dive. During one of my dives I felt a presence in front of me at about 50 feet and I naturally opened my eyes to see what was out there. It was Ted. He kept his characteristically relaxed pose with arms crossed over his chest as he analyzed my dive. He stayed with me all the way down to a 100 feet and then all the way back up to the surface. After we finished our recovery breaths he gave me some very helpful teaching points. That brief dive reminded me how dedicated Ted is to freediving, and the huge difference it makes to dive with someone as knowledgeable, capable and dedicated as he is. If you are reading this, chances are you are trying to find a freediving course. After my experiences with different instructors around the world I strongly recommend you take your course with Ted. I can say this without hesitation that you will be learning from one of the best instructors in the world. I’ve been fishing ever since I was a child and coming to south Florida to do so for the past 10 years. I got the opportunity to move here upon graduation of college and did so immediately. After a few years of fishing on my buddies boats I got a turn to get in the water and spearfish, right away I was intrigued. After a few trips I quickly realized I had no technique, couldn’t hold my breath, and was unsafe. My buddy of mine told me “Dude just go take Immersion freediving with Ted”. That was in November 2016 and I put my gun down for the winter and signed up for Teds first class in spring 2017. We started out in the classroom for the first day where we all quickly learned about the seriousness of blacking out and I took the biggest breaths of my life . After more practicing we headed to the pool where we started exercising the breathing and things we learned in class. Overall a good day 1 with a lot of information. Day 2 we got back in the pool to brush up on what we had learned then headed to the ocean. In the ocean things get a bit more serious as you drop the plate down and begin diving to it. To my surprise after holding my breath well over 2 minutes I was having trouble hitting 33 feet comfortably. When I surfaced Ted pulled me aside and reminded me that I have the breath hold to dive 100ft. He explained to me that I needed to slow down and control my body and mind and remain calm. (There is no rush or pressure in this course you go at your own pace) The next dive I went to 33 feet comfortably, and the following dives to 50ft comfortably the rest of the day. The third day arrived and we completed the necessary safety actions to get certified and complete the course. I finished the course diving calmer and more comfortable and hit the max depth of 66 feet. Overall the course was well worth the money. I came in wanted to be safer, hold my breath longer, and dive deeper. I got all this and much more. Ted is dialed in and a great instructor, the course was very organized. Watch the videos, listen to Ted, and you’ll come out a better safer diver. William Laribee has been spearfishing for 12 years. He has taken the 3 freediving courses over the years. He explains how this course was this best course he has taken and how it directly translates to helping him become a better & safer spearfisherman. I am a 22 year old student residing in Houston Texas and recently was very interested in spearfishing. I have no background in the area. I had been certified to scuba dive in 2011 and that’s pretty much all the experience I had in the water. After watching some spearfishing videos on you tube, I was fascinated and amazed with the idea of freediving to these depths while holding your breath. I began looking and found a course in corpus Christi, Texas in October 2012. I signed up for the freediving course. My experience with this course was mixed with good and bad things. The course consisted of 1.5 days 1/2 a day in the classroom, 1/2 a day in the pool and 1/2 in the ocean. I learned a lot during the class and pool session and it was very good information. However the ocean session did not prove to be as successful for my case. First of all, we had to go out on a tugboat about 40-50 miles out (cost of the boat fees per person was around 300 dollars) and the conditions were horrible. 6+ foot seas. Extremely choppy. Even after taking bonine hours before the trip I became terribly seasick. Upon getting to the place where we were going to do our dives, I geared up and went in the water. Even though I felt horrible, I had spent a lot of money and wanted to complete the course. As I tried diving the lines, I could not get past 15 feet. Even at that depth my ears were in great pain. was unable to go down any further. I got even sicker and had to return to the boat, disappointed that I couldn’t complete the course. Even though I was very disappointed after the course, I was not ready to give up on my freediving goal. 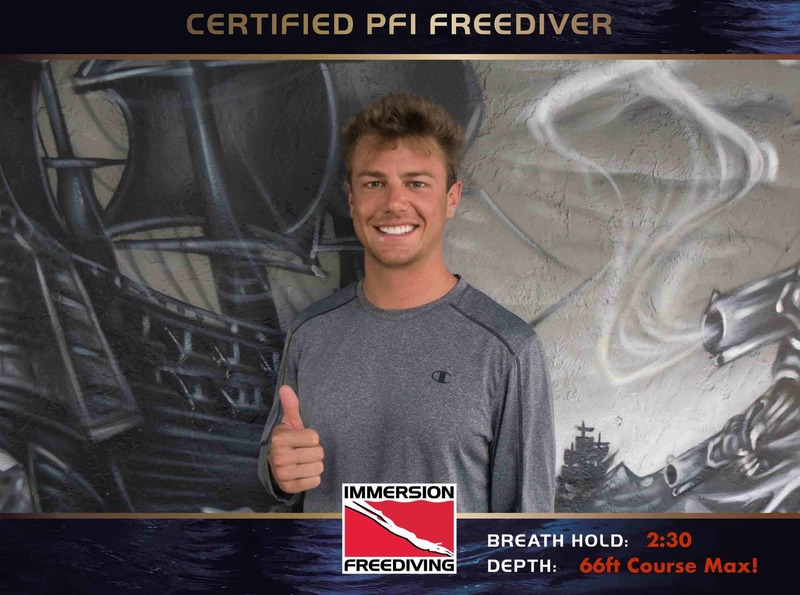 I kept researching and found out that there existed another organization, PFI which also taught freediving. After looking at their courses, the had very similar guidelines but this course was longer. Also I began to look where to take the course and found that there weren’t any courses near to where I lived. I found immersion freediving’s website very helpful and motivating, so I gave them a call. Upon calling, I was able to speak directly with Ted, the Owner and sole instructor of the company. I explained to him what my past experience freeving was and his response made me rethink if I had taken the right course from the start. First of all, when I told him how bad the seas, he was amazed that we even went out in those conditions. Also after telling him the problems that I had equalizing, he explained to me that there were 2 ways of equalizing. I had heard this in my first course but was told that it wasn’t taught until the next level because it was difficult to learn. Ted assured me that through a Skype session included in his course, he would teach me how to properly equalize using the frenzel method, contrary to the one I was using, the valsalvia. Upon hearing Teds background as a professional freediver and these motivating words, I signed up for the course. Though the course was 1200 miles away in ft Lauderdale, I was determined to reach my goal anyway possible, so I booked my plane ticket and hotel. 2 Weeks before the course I met with ted via Skype, and it took an hour and afterwards I learned to properly use the more efficient frenzel method. Though I am not the fastest learner, I was successful at it. Upon arriving to ft Lauderdale, I stayed at one of the hotels which he has a discount rate if you take the course. The freediver course was great! We had our classroom lesson on Friday afternoon at his house, where I learned much more than I had in my previous course and the information came with more credibility because of Teds accomplishments as a professional freediver. The pool sessions on Saturday and sunday proved very effective in polishing entries and rescues that we were to use in the ocean sessions. On Saturday, I felt great in the ocean. With only a short ride to the ocean on Teds boat, I was not seasick at all. After completing the Saturday ocean session it felt great because I reached 15 meters. I was so happy. The frenzel method really worked. On Sunday, came the hrdest test of all – 20 meters. Though it took me a few times, I finally reached 20 meters and was extremely happy. The course was great and I owe my results to Ted. His way of teaching the course gives you confidence and he will help you overcome any difficulty that you may run across in the course. There is no comparison between the other course that I took and his course. Its, longer, has more useful information, and is much better in all areas. My results prove this. If you ever plan on taking any freediving course, there is no doubt that you should take it with IMMERSION FREEDIVING. You wont regret it. The Short Story: Let me start with the fact that my freediving experience before Ted’s class was limited to freediving to recover dropped items as a teen (30 years ago), minimal spearfishing, and recreational free diving on vacation. I am an active scuba instructor and very comfortable in the Ocean despite the minimal freediving experience. The Immersion Freediving Intermediate Freediving class was one of the best diving classes of any kind that I have taken. You will learn so much in 4 days that it will take you days or weeks after before it all sinks in. The money and time invested will make you a safer and better waterman not to mention improve your freediving. Thank you to Ted and his team for a superb program from registration all the way to arranging for the awesome wildlife visits on our last dives. The Long Story: Freediving is something that always fascinated me and something that I’ve always wanted to learn. As a scuba instructor here in Florida I was able to ask my network of contacts in the industry who they suggested to learn from, Ted Harty, and Immersion Freediving’s name came up over and over. After taking the course I understand why. The amount of information I’ve learned to improve my free diving and do so safely is overwhelming and days later I am still processing. Whether you are in the classroom, pool, or in the ocean safety skills and technique are reinforced. The class size is no more than 5 people which allows you to get one on one treatment. Because of this you will not be able to hide in a crowd and you will be expected to perform, by no means will you be perfect so don’t expect to be. After each dive you will understand what you did well in addition to what you need to work on from Ted. He can provide you this feedback because he is right there with you on the dive regardless of the depth and not just observing from above. Ted does this for every student on every dive. I may be wrong but I doubt in many circumstances that you will find the same level of supervision from a scuba instructor who is now a newly minted freediving instructor. This is not a slam to other instructors or agencies but more a testimony to the level of supervision Immersion Freediving provides their students as well as the skill and experience of the instructor. Am I now a perfectly tuned freediving machine? Far from it, but given where I started at the beginning to where I am now my diving is night and day. I went from a sub 3 minute best breath hold to 5 minutes and 5 seconds and did the deepest most comfortable free dive I’ve ever done. But, In the end deeper was not the point, there was never any pressure to push beyond what people were comfortable with or in my case what my sinuses were limiting me. In fact, when I became the most frustrated I was encouraged to not push through but instead focus on technique and “enjoy the dive” by Ted. I still have a long way to go before my dives are all locked in but by applying tools and safety procedures I have learned they will get there. Thank you Ted and the rest of your company for the awesome experience. I only wish I would have your class years ago. My name is Chris Schirmer. In regards to my confidence in the water I would say it’s pretty high. I have been sailing most my life, into most water sports that are out there, been a PADI certified diver for almost 15 years and now a spear fisher. I began spearing and free diving back in September 2015 when I moved to Bermuda and wasn’t long until I took Ted’s Intermediate Class in May 2016. Prior to the course, I was operating off being self taught, the internet and buddies who I dived with. I would say this is probably the most common means of learning the sport. When I learned of Ted’s course through a friend, it became obvious for me to widen my knowledge of diving by taking his intermediate Performance Freediving course. Ted’s Course was a complete game changer. In regards to how I was diving and the knowledge I knew to what I came out of the course with was night and day. Safety, which can be easily forgotten is now on top importance to me for diving. Everything else I learnt during the course was a bonus. I knew previous of what we were taught that free diving had its dangers but to be able to have a fraction of the knowledge to what Ted knows was necessary to me. Each subject that Ted delivered to us in the class was executed perfectly and repetition definitely taught me in the best way possible. I began the course with a breath hold of just over 3 minutes and diving to a max of 40-45 feet with a very limited bottom time. With Teds instruction I left with a breath hold of over 4 minutes, a 108ft dive an most importantly doing it safely. Best course I have ever taken and couldn’t recommend it more to any free diver or spear fisher.